Neoprene Rubber Coating is an excellent finish to cover cement blocks to be used in the pond, stop leaks in concrete waterfalls, or cover concrete or block or other masonry type ponds. Herco Neoprene Rubber Coating is an excellent finish to cover cement blocks to be used in the pond, stop leaks in concrete waterfalls, or cover concrete or block or other masonry type ponds. One coat of primer and three coats or liquid rubber are recommended for complete sealing of surface. Water may be added as early as 24 hours after last coat has dried. Fish can be added 72 hours later. (We still recommended that a normal pond establishment period pass after stocking with plants before putting in fish) Each gallon of coating covers approximately 100 to 150 square feet for the three coats needed. Provides a completely inert environment for fish. Long lasting & will not peel or deteriorate. Works with block, brick & concrete. Safer environment for fish & aquatic plants. Instant & complete pH balance & pond stabilization. Economical, Environmentally safe & cures fast. Easy to apply, can be brushed, rolled or sprayed. Leak proofs pond & filter. 4 Colors: Black, Grey, White & Clear. STEP 1: Clean the pond surface with Herco Cleaner/ Thinner. Cleaner will dissipate completely in the air. STEP 2: Apply one coat of Herco Primer on entire surface. Let completely dry. STEP 3: Apply three coats (consecutive) of Herco Neoprene coating. Once the surface is clean and com- pletely dry, apply the first coat. Part of the first coat may be absorbed into the porous surface of the concrete. This is to be expected. Allow 45 minutes to 1 hour to dry. Add the second and third coats allowing each to dry completely before proceeding to step 4. STEP 4: Once the final coat has dried, allow the rubber to cure for at least 24 hours before adding water to the pond. After 72 hours, you may add your fish to the pond. Upon completion of these 4 steps, you will have a long lasting liner that is inert, non-abrasive, and consequently, a safer environment for your fish. What is the HERCO Pond Coating System? The HERCO Pond Coating System is a line of products manufactured by Hecht Rubber Corporation specifically designed to coat, seal and leak-proof your pond, eliminating many of the problems associated with pond construction and upkeep. The system consists of four components: HERCO TC700 Cleaner, HERCO CCF Crack Filler, HERCO PSC Primer and HERCO H55 Coating. The products are custom formulated for ponds and are 100% fish-safe and environmentally friendly. HERCO Coatings create a durable and long-lasting membrane, sealing off pores in new construction ponds as well as leaks and cracks which may develop in ponds over time. The elastomeric nature of the membrane allows for shifting of the concrete underneath, such as may result from seasonal expansion and contraction. HERCO Pond Coating acts as an impenetrable barrier, preventing the buildup of alkaline salts and other contaminants that typically leach out of concrete and into your pond water. How long has HERCO Coating been on the market? 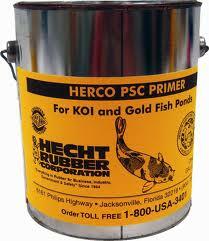 Hecht Rubber Corporation of Jacksonville, Florida has been in business since 1944 and we have been manufacturing and marketing HERCO Coating for 45 years. In other words, this product is a proven performer! Our coating is in service on thousands of ponds large and small all over the USA and beyond. How much product will I need to cover my pond? The amount of product required depends on the size of your pond. A quick way to estimate the square footage of a typical pond is to take your length, width and average depth and multiply the three. For example, if your pond is 10ft by 10ft and 2 feet deep, 10x10x2 =200. One gallon of HERCO Coating will cover about 80 to 100 square feet with the recommended 3 coats, so you will need two gallons of coating in this example. It is always a good idea to allow a little extra, especially if you have overhangs, rocks, waterfalls, etc. Can I apply HERCO Coating over old paint or coatings? Yes, but only if the old product is adhering well to the surface below. If you have paint of old coatings that are flaking off, you must completely remove the old product using mechanical means such as wire brushing, sandblasting, scraping, pressure washing (minimum 3000 psi). After removing the old coating and all dust and debris, we recommend a final cleaning with HERCO TC-700 cleaner prior to applying your new coating. What surfaces can I cover with HERCO Coating? 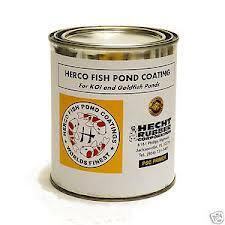 HERCO Coatings bond tenaciously to just about any surface used in pond construction! Concrete, brick, rock, block, gunite, marcite, wood, steel, aluminum, even plastics and glass can be coated. The surface must be solid, dry and free of debris and you cannot apply the coating directly to dirt or gravel. Do I need to use the HERCO PSC Primer before applying the coating? The HERCO PSC Primer absorbs deep into the microscopic pores of the surface you are coating and is the “first line” of defense against leaks. The PSC primer helps with adhesion of the HERCO H-55 Coating and is an integral part of the coating system. Primer is not required if you are coating directly over a rubber pond liner (see below). How long will it take to coat my pond? This depends on the size of your pond. The average garden Koi pond takes 1 or 2 days. Be sure to follow all instructions and allow a minimum of 3 to 4 hours between coats. Can I apply HERCO Coating on top of my old pond liner? Yes! HERCO H-55 adheres well to rubber, even your leaky old pond liner! Just be sure to clean the surface thoroughly before you apply the coating. 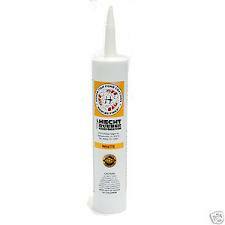 NOTE: You will not need to use the PSC Primer when applying coating directly over a rubber liner. How long does concrete have to cure before applying HERCO Coating? Concrete surfaces must be fully cured, clean and dry before applying coatings. Generally speaking, concrete needs about 30 days at 75F to cure and dry out before applying any coating or sealer, though it may take significantly longer in rainy or cold weather. The product will not adhere well or cure properly if applied to wet concrete. 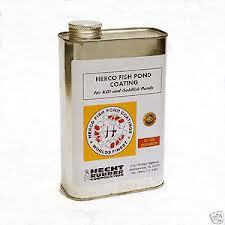 Is the HERCO product safe for my fish? Yes. The HERCO Coating System is specially formulated for pond use. When properly applied and cured, the membrane is completely inert and 100% safe for your fish and aquatic plants. The formulation is also environmentally friendly and meets or exceeds the most stringent regulatory requirements. Under what weather conditions should I apply the product? Ideally, the coatings should be applied under temperate conditions. HERCO Coatings are air-cured and should not be applied at temperatures under 45F or in rainy weather, as this will prevent proper curing of the product. If the temperature is above 90F, it is best to coat in the early morning or evening and out of the direct sun. What happens if it starts raining in the middle of the job? While it is best to start the job when the forecast is for clear weather, in the event that rain falls on the uncured coating, simply allow extra time for the coating to dry completely before continuing with the job or applying any additional coats. The coating needs to be dry to the touch before you apply an additional coat.